An archive video film of many types of Southern locomotives on various lines of the Southern Region. 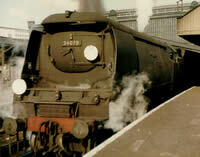 The South Western Division was the last to survive with steam traction up to the Summer of 1967. There is ample coverage of these lines from Waterloo to Basingstoke during a period from 1960 to 1967. The South Eastern Division lost most of its steam in 1962 but Folkestone is seen when its harbour branch was still worked by steam traction albeit by Western pannier tanks. In this Division Tonbridge, Westerham, Gravesend, Gillingham and the Allhallows branch are also seen. Lydd to New Romney with the last DMUs. The famous Romney, Hythe and Dymchurch line is also visited. Many specials in the last days of steam on the Waterloo to Basingstoke line are covered, with visiting Eastern and Scottish locos included. The usual Bulleid pacifics are seen in quantity alongside Schools, King Arthurs, S15s, moguls and pannier tanks. Cover photo:- Keith Pirt, 30908 & N class at Basingstoke, June 1960. Cover photo: Jim Clemens, 35011 “General Steam Navigation” at Basingstoke. 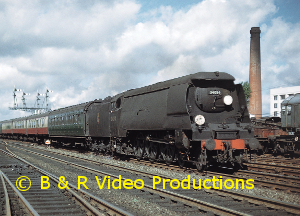 Filmed from 1960 to 1967, we journey from WATERLOO to WEYMOUTH, BASINGSTOKE to SALISBURY, and on to the Somerset and Dorset from TEMPLECOMBE to HIGHBRIDGE and BATH. On the South Western main line we stop off at EASTLEIGH to visit the Works in 1963. There is extensive coverage of the Isle-of-Wight railway system, RYDE to VENTNOR and RYDE to COWES via NEWPORT with passenger and freight. We visit BOURNEMOUTH and WEYMOUTH with its quayside tramway serving the Channel Islands boats in the early 1960′s. Quite unique is a railtour to the ISLE of PORTLAND and EASTON. There are numerous classes of motive power to be seen, from small Class 02 tanks on the Isle-of-Wight to the Bulleid pacifics with the occasional King Arthur on the way. There are freight types like Maunsell moguls, S15s, 700 0-6-0s, H16, W tanks and the inevitable Standards; S & D 2-8-0, Ivatt tanks and Western Panniers including GWR Dock tanks. Filmed mainly in colour this video takes a fascinating and nostalgic look back at the steam scene of the 1960s in many locations on the Southern Railway. The next volume in this definitive series of the end of Southern steam, now being collected as the historical record of the time, covers the four months of October to December 1966 and into January 1967. Once more, sixteen cameramen supplied material for this volume allowing the full story to be told for the period. 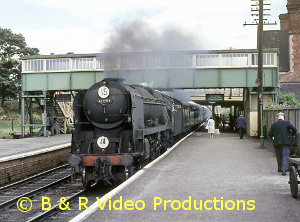 As a video of Southern steam it also stands on its own since the general steam service is filmed over the South Western lines from Waterloo to Weymouth. However, as with all videos in this series, full coverage of rail tours of the period is included. The first seen is the RCTS Four Counties tour covering the Tooting branch with Guildford’s shed pilot engine 30072. Next the Dorset and Hants tour with two un-rebuilt pacifics taking in the Somerset and Dorset to Blandford, the remains of the Ringwood branch and finally Hamworthy Goods. Merchant Navy class 35026′s visit to Newcastle, Doncaster and York. 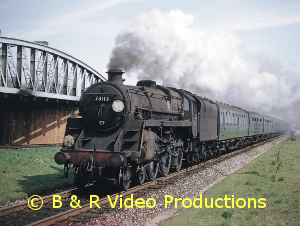 “CLUN CASTLE” and Britannia 70004 took Bulleid stock to Stratford on Avon and Stourbridge Junction. The end of steam on the Isle of Wight did come on the last day of December 1966 and coverage is given to the whole route remaining from Ryde Esplanade to Shanklin. Lastly the rail tour to the Bridport branch via Salisbury, Westbury and Maiden Newton with all its troubles is fully related. Oh yes, and also the last steam run to Exeter!